Waterslides are Open Through Labor Day! 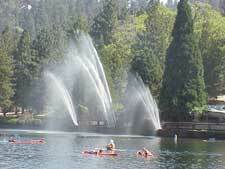 Refresh yourself with a swim in a cool mountain lake. Bring the family and enjoy temperatures in the 80s instead of the 100s. Lake Gregory Regional Park offers a great place for visitors to escape the summer heat of Southern California. 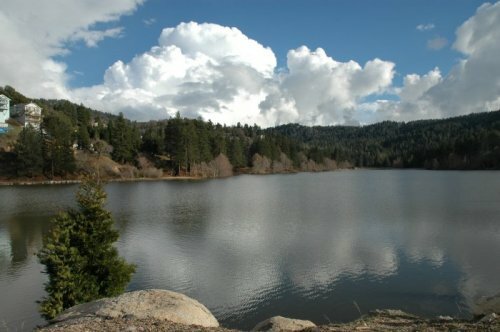 The lake's surface is at an elevation of 4,550 feet and the ridges around the lake climb up to a thousand feet higher. Summer temperatures are often 20 degrees cooler than in San Bernardino, which is only 14 miles away by car. 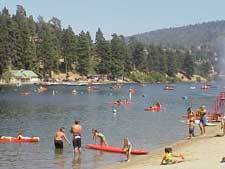 Unlike Lake Arrowhead, which is private, visitors can swim, boat and fish in Lake Gregory. In summer, many visitors from the urban areas of Southern California come to Lake Gregory, where they can swim, ride on the lakes two 300-foot waterslides, and rent paddleboards, rowboats, paddleboats, sailboats and water cycles. Outside of the swimming area, anglers will find excellent fishing for trout, catfish and bass. 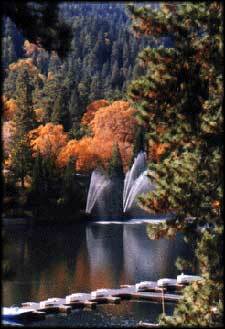 The lake is also an excellent place to exercise in the cooler mountain air whether you run or walk. There is now a state-of-the-art fitness trail with all-new exercise stations along the scenic path around the lake. 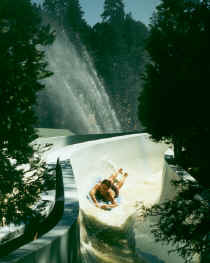 The dual waterslides at Lake Gregory are popular with bathers. The lake's swimming area includes sandy beaches, rest rooms, two snack bars, grills, picnic tables, picnic shelters, sand volleyball courts and more. The grill and picnic areas may be reserved for large gatherings, where visitors can combine swimming, picnicking, watersliding and an outdoor mountain barbeque. The Crestline Chamber of Commerce is sponsoring five fishing derbies this year at the lake. These will be held on the following dates: April 30, May 28, July 2, Sept. 3 and Oct. 1. For more information, click here to go to the Chamber's trout derby page. For more information about Lake Gregory Regional Park, call the park directly at 909-338-2233, or click here to go to the Lake Gregory Regional Park Web site.